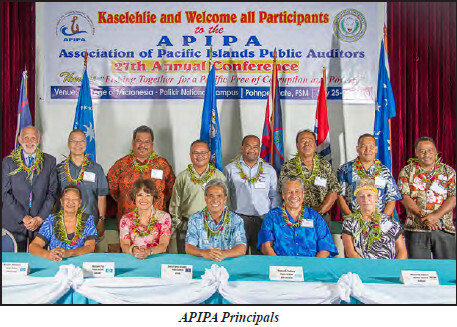 Pohnpei, FSM—Meeting with the theme “Fishing Together for a Pacific Free of Corruption and Poverty”, the 27th Annual Conference of the Association of Pacific Island Public Auditors (APIPA) kicked off at the College of Micronesia-FSM in Palikir. Hundreds of people from all over the Pacific were present for the opening day ceremonies where Deputy Inspector General of the U. S. Department of the Interior, Ms. Mary L. Kendall, delivered the Keynote Address. The opening session began with the entrance of the Principals from each represented country and territory preceded by their flags. Pohnpei’s Governor Marcelo Peterson welcomed the delegates to Pohnpei and to their conference. Audit, Audit Supervisory, Finance, and Accounting & Management. Courses under the Audit track were “Audit Analytics & Risk Assessment”, “Audit Evidence and Documentation”, “Internal Controls for Auditors”, and “Interviewing Techniques for Auditors”. Courses offered under the Audit Supervisory Track were Assessing Risk in Your Audit Office, Auditing Standards Update, Finding and Reporting on Fraud, and How to Implement Big Ideas in the Management of an Audit Oversight Office -- Large and Small. Finance Officers and employees of government agencies who are not auditors were not excluded from the training at APIPA. Under the Finance track the courses offered were “Government Auditing for Non-Auditors: What Do You Do When the Public Auditor Comes Knocking?”, “How To Reduce Bias in Decision Making”, “Introduction to Governmental Accounting”, and “Managing Your Grant Successfully”. For the Account and Management track the course were “Advanced Governmental Accounting Issues that Remain Perplexing to this Day”, “The Essentials of Project Management”, “GASB Update: Where Are We Going from Here?”, and “Internal Controls for Managers”. On the final day, representatives from the World Bank gave a presentation during the lunch hour. The Iso Nahnken of U, Ihlen Joseph is the Pohnpei State Public Auditor. He was also the chair for the 27th Annual APIPA conference. On the opening day, he hosted a reception for the delegates. He said that all of the food and beverages were donated by local businesses and individuals. On the last night of the conference, APIPA hosted a reception at Mangrove Bay Bar where certificate of completion were handed out to all of the participants who had successfully completed their course of studies. Represented countries and territories at the conference in no particular order were American Samoa, FSM National Government, Chuuk State, Pohnpei State, the Commonwealth of the Northern Marianas Islands, Guam, the Republic of the Marshall Islands, the Republic of Palau, Yap State, Kiribati, and Kosrae State.